Dr. Paul Campbell, a longtime vascular robotic user and a leading interventional cardiologist at Carolinas Medical Center NorthEast, describes the technologist role during robotic PCI and the potential to improve their technical, panning and anatomy skills. These can be critical components to expanding staffs' knowledge and growth within the cath lab. During our AUT courses, our experienced course proctors aim to help attendees benefit from the educational content to develop advanced-level clincal skills in operating CorPath GRX and taking away key learnings that can be applied when they are stationed in their own cath lab. Training courses also give attendees the opportunity to meet other robotic users from different facilities across the country, encouraging them to share best practices with one another. We want users to leave our courses feeling invigorated to train others in their own facility on the lessons they learned during Advanced User Training. AUT attendees spend a full day at Corindus headquarters, right outside of Boston, in Waltham, MA, to get hands-on experience with CorPath GRX and an advanced simulator, didactic training by experienced course proctors and a deep dive into the inner workings of the CorPath GRX System by our engineers. 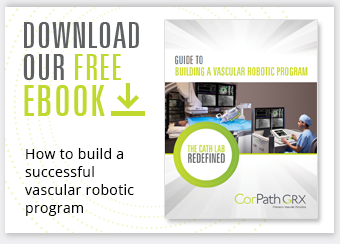 Our goal is to provide best-in-class training to cath lab staff to continue the momentum of growing Vascular Robotic Programs and ensure staff are armed with the knowledge they need to excel during robotic PCI procedures. Interested in attending Advanced User Training? Talk to your local Corindus representative for more information.